Outline: Expounds on the Lord's Prayer. Must worship and pray to the true God and obey Him. John 3:16. H: Brothers and sisters, last night we started a lesson series on prayer. Tonight we will continue our studies about prayer. Now listen to teacher Hassan and his student Yusuf. are prayers that contain sin. You also said there are two kinds of prayers that have sin. H: That is right, Yusuf. Do you remember what the two kinds of prayer were? What were they? Y: Yes, I remember. One of them. The first one was: a man plans evil in his heart and then when he gets into trouble, he prays and begs to God for help. H: That is right, Yusuf. You remember very well. Now I will pray the prayer the Lord Jesus Christ taught His disciples and those who follow Him now. The words are from the Gospel. "Therefore when you pray, pray like this: Our Father, who art in heaven, let your name be holy. Thy kingdom come, thy will be done on earth as it is in heaven. Give us today our daily bread. And forgive us our debts as we forgive our debtors. And lead us not into temptation but deliver us from evil. For thine is the kingdom and the power and the glory forever and ever. Amen". Y: Teacher, that is a nice prayer. Indeed, I never heard that kind of prayer before. Do the people who follow Jesus Christ worship Him today in that way? H: That is right, Yusuf. That prayer contains praise, worship and asking God for the forgiveness of sins you have done against God and others. That prayer has the request for food. It teaches us how to win over Satan and sin and temptation and influence. And when Jesus Christ taught His disciples that prayer, He added these words: If you forgive men their trespasses, your father who is in heaven will also forgive you. Y: Do you mean, teacher, that if I don't forgive someone's trespasses that God will not forgive my trespasses? Those are hard words to take. H: Yes, God said those words. If you don't forgive one's trespasses who sinned against you, He will not forgive you your sins. It is the commandment of God. If we want God to forgive us, we have to forgive those who sinned against us. Otherwise God will not accept our prayers. Y: Alright, teacher, I am beginning to understand. If a man holds a sin or a grudge in his heart, and will not confess his sin, that man's prayer is a prayer which contains sin. I understand now. Also God will not accept his prayer, for the Bible says, "If I plan evil in my heart, God will not hear me". Ps 66:18. God will not accept that prayer. H: That is a rule about prayer, Yusuf. If we want God to accept our prayer, we have to know the rules about prayer. One of the rules of praying is that we should pray with a clean heart and in sincerity and without sin. If there is sin in the heart, God will not accept that prayer. If you hate someone, that is sin. Y: Teacher, is hating sin? H: Yes, Yusuf, hating and anger and pride and exaggeration and uncleanliness and deceit and being hypocritical are all sin. All our evil plans. And the Bible says, "Whosoever hates his brother is a murderer. If anyone says, 'I love God', and hates his brother, he is a liar, because how can he hate his brother, whom he can see, and say he loves God, whom He can't see? And we have this commandment from God: that is, anyone who loves God should love his brother, too". Y: I think, teacher, that all people have sin in their hearts. Isn't that so? H: That is right, Yusuf. Therefore the first prayer that every man should say is this: "O Lord, forgive me, a sinner". The Bible has this confession of two men's prayers. Yusuf, hear these prayers: "Two people set out to pray at the church. One was a priest and the other a tax collector. While standing upright the priest prayed this - 'O Lord, I thank you that I'm not like other men who violate the law and who are not righteous. They are adulterers, even as is this tax collector. I pray twice a week and I pay one tenth of all that I possess'. But the tax collector stood at a far place and he didn't want to lift up his eyes to the sky, but he whispered in his heart, saying - 'O Lord, be merciful to me, a sinner'. Then God said, 'The first will enter into his house having been judged, for whosoever will lift himself up will be cast down, and whosoever puts himself down will be lifted up". to confess our sins to Him. 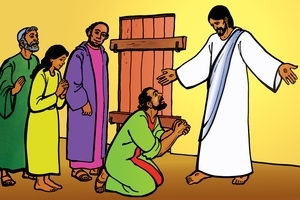 The way the priest prayed did not make God happy; but the way the tax collector prayed made God very happy. Y: I understand now, teacher. God does not want us to speak about our goodness when we pray. He doesn't want us to say, "God, I am a good and nice man. O God, I am not a thief. Help the poor people. I, God, I am not a sinner". God is waiting for us to confess our sins - the prayer that says, "O Lord, forgive me, a sinner". H: Yusuf, there are so many people who worship God and yet go to hell. Did you know that? Y: No, teacher, I thought that everyone who prayed would go to heaven. H: No, Yusuf, many of those who worship God will go to hell. Y: Teacher, you will have to make that clear for me. I don't understand what you mean. H: There are many people who worship in the world. Some are those who believe in the true God and others are those who follow after other religions. Some worship idols and trees and rivers and the cows and the stones and other things. They all worship something or someone. worship the true God. But those who believe in the true God will go to heaven. Isn't that so? H: No, Yusuf. All the people who believe in the true God will not go to heaven. Some of them will go to hell. Others will go to heaven. Y: Teacher, how can you say that? I know that everyone who believes in the true God will go to heaven. H: No, Yusuf. Those who believe in the true God - some will go to heaven and others will go to hell. Y: Teacher, you will have to make that clear to me for me to understand. prophecy in your name and did we not cast out devils in your name and did we not do many powerful things in your name? Then I shall say to them, I never knew you - get away from me, you sinners". H: Yusuf, anyone and everyone should know the Bible and the words that I told you, because there are so many people who confess with their mouth that they believe the true God, but they continue in their sin. God considers the heart, not just the mouth and its confessions. If you are a sinner, He will say to you at the time of judgement, "I never knew you, get away from me, you sinner". Y: Who are sinners, teacher? H: Yusuf, sinners are those who commit sin. They speak lies and they steal. They commit sin everyday. They are not freed from the power of their sin. Y: If that is true, teacher, who can go to heaven? H: God knows that we cannot stop our sin. He knows that we cannot free ourselves from our sins. Therefore God sent the Lord Jesus Christ to us to free us from all our sins. The Lord Jesus Christ Himself said these words: "Truly, truly, I say unto you, whoever commits sin is the slave of sin, but if the Son free you, indeed you will be freed." Yusuf, the Bible says, "For God so loved the world that He gave His only begotten Son, that whosoever believes in Him should not perish but should have everlasting life; "God did not send his Son to condemn the world but that the world may be delivered by Him." Therefore the Lord Jesus Christ said to this world, "come to me all those of you who are heavy burdened and I will give you rest, and you shall have rest for your souls."
? : Brothers and sisters, maybe you want rest for your souls. Maybe you want your sins forgiven and you cannot get the power of stopping sin. If you are such a person, we will send you the Bible of the Lord Jesus Christ, by which you can learn how to overcome sin. Write us a letter and send it to: VOICE OF THE NEW LIFE, PO BOX 127, ADDIS ABABA, ETHIOPIA. We will send you a free book. Don't forget to listen to the VOICE OF THE NEW LIFE every night.